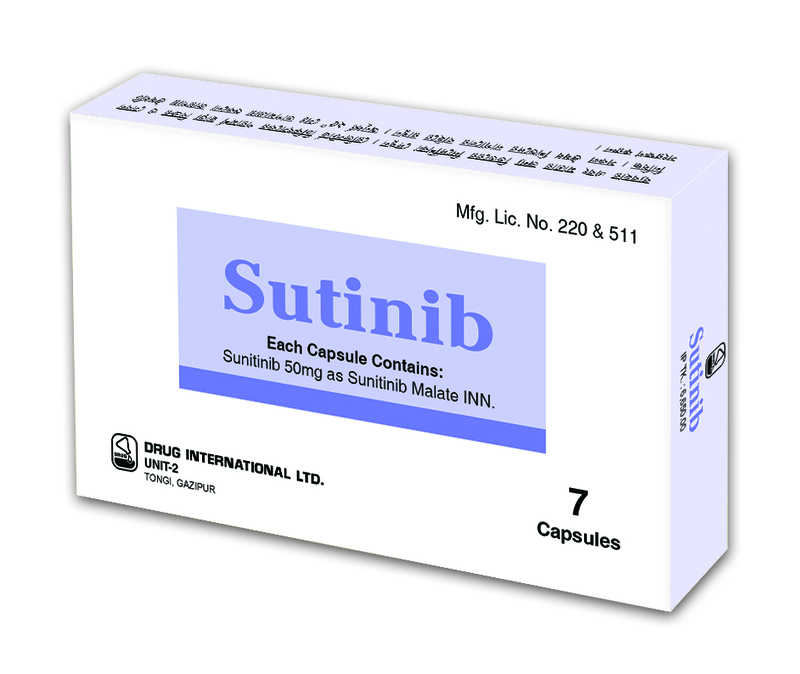 Composition: Each capsule contains Sunitinib 50 mg as Sunitinib Malate INN. Indications: Gastrointestinal Stromal Tumors (GIST): It is indicated for the treatment of gastrointestinal stromal tumors after disease progression on or intolerance to Imatinib Mesylate. Advanced Renal Cell Carcinoma (RCC): It is indicated for the treatment of advanced renal cell carcinoma. Adjuvant Renal Cell Carcinoma (RCC): It is indicated for the adjuvant treatment of adult patients at high risk of recurrent RCC following nephrectomy. Advanced Pancreatic Neuroendocrine Tumors (pNET): It is indicated for the treatment of progressive, well- differentiated pancreatic neuroendocrine tumors in patients with unresectable locally advanced or metastatic disease. Dosage and administration: Recommended Dose for GIST and Advanced RCC: The recommended dose of Sutinib for gastrointestinal stromal tumor (GIST) and advanced renal cell carcinoma (RCC) is one 50 mg oral dose taken once daily, on a schedule of 4 weeks on treatment followed by 2 weeks off (Schedule 4/2). It may be taken with or without food. Recommended Dose for Adjuvant Treatment of RCC: The recommended dose of Sutinib for the adjuvant treatment of RCC is 50 mg taken orally once daily, on a schedule of 4 weeks on treatment followed by 2 weeks off (Schedule 4/2), for nine 6-week cycles. It may be taken with or without food. Recommended Dose for pNET: The recommended dose of Sutinib for pancreatic neuroendocrine tumors (pNET) is 37.5 mg taken orally once daily continuously without a scheduled off-treatment period. It may be taken with or without food. Or, as directed by the registered physician. Use in pregnancy and lactation: It can cause fetal harm when administered to a pregnant woman. There are no available data in pregnant women to inform a drug-associated risk. If it is used during pregnancy, or if the patient becomes pregnant while taking this drug, the patient should be apprised of the potential hazard to the fetus. Lactation: There is no information regarding the presence of Sunitinib and its metabolites in human milk. Because of the potential for serious adverse reactions in breastfed infants from Sutinib, a lactating woman should be advised not to breastfeed during treatment with Sutinib and for at least 4 weeks after the last dose. Packaing: Each box contains 1x7’s capsules in blister pack.